For those of us in more northerly climates, autumn seems to naturally call us to go more inward. It’s also a time of nourishing ourselves in a deeper way – we turn to root vegetables, heartier stews and soups, and warmer foods. This is actually consistent with what traditional healing systems like Ayurveda and Chinese medicine encourage – shifting our diet and lifestyle along with the change of the seasons or time of year. I apply this seasonal eating approach to my herbs, as well, replacing my summer sun teas and lighter medicinals with heartier plants in my cooking, teas, and seasonal routine. Just as the detoxification supporting bitters and leafy greens (think: nettle, dandelion leaf) signal springtime and bright edible flowers (like calendula and borage) grace your summer diet, the fall season also has traditional botanicals that not only tend to be harvested at this time of year – especially the roots of plants where energy is returning to in order to nourish the plant itself for winter. And what better way to do this than with autumn-centered medicinal herbs, including some immune-boosting roots and mushrooms which – regardless of where you live – supply us with many of the right nutrients and healing compounds we need to fight the health issues we encounter most during the autumn: particularly cold and flu. Want some ideas and inspiration for using herbs to boost your immunity this fall? Here are the herbs that top the list of my favorites to include in your food, in teas, and for cold and flu prevention and support. Medicinal mushrooms: I like to include more medicinal mushrooms into my diet and my herbal remedies at this time of year – shiitake mushrooms are especially nice (not all the medicinal mushrooms taste so delicious!). You’ll find them in my Immunity-Boosting Miso Soup. Shiitake mushrooms demonstrate antiviral activity to keep the common cold at bay. Other adaptogenic mushroom picks include reishi and chaga, which can be taken in powder, capsule, or tincture form. You can also include mushroom powders in your coffee or smoothies, or use capsules. Burdock root: Gobo, as it is called in traditional Chinese medicinal cooking, is another fall favorite and seasonal harvest. Burdock root is rich in vitamins and minerals and its inulin content (as is found in dandelion and elecampane root as well) is being studied for its beneficial impact on the immune system, especially in the area of the gut-associated lymphoid tissue (GALT). I love it cut into matchstick-sized pieces in stir fries, seaweed dishes, and sushi, and you can include it in a pickled vegetable recipe. Astragalus root: A staple of Traditional Chinese Medicine, astragalus is a warming immunotonic herb well suited to fall. Complex polysaccharides in astragalus act as immunomodulators while the nutrient-rich root nourishes the body deeply. Use it in powder form, tincture, or added to soups and stews (see my Immune Boosting Soup recipe). Garlic: Garlic is the original super immunity herb. Compounds in garlic boost the disease-fighting response of white blood cells when faced with viruses in the body. Garlic helps prevent sickness in the first place, lowers total duration of cold and flu, and also diminishes the severity of symptoms like headaches, fever, and sore throat. Use fresh, organic garlic and add to your recipes in the last few minutes of cooking to preserve allicin, one of its active compounds. The best way to use it is to include 2-3 cloves of garlic in your diet each day – in soups or fresh-pressed into salad dressings. Elderberry: A warming herbs that’s a favorite with the kids and adults alike in the form of elderberry syrup, this is my go-to herb for early signs of flu. Studies have shown that elderberry extract can significantly lower duration of influenza while lowering the need for medication, when compared with placebo. My favorite way to use elderberry is in tincture or syrup form. The typical dose for this is 3 tbsp. of syrup per day for adults (3 tsp/day for kids > 2 years old) starting at the earliest signs of flu. Of course, if you think you have the flu, also seek appropriate medical care. Ginger: While ginger itself is actually a tropical plan, the root (rhizome) of the ginger plant has been used for medicinal purposes for thousands of years to warm the body, beat chills, and reduce aches, pains, and digestive symptoms – accompanying colds or just more generally. Organic ginger can be used fresh or powdered. Juice it raw, add to smoothies, to recipes, or steep it as a tea. To make ginger tea, use 1 tbsp. of freshly grated ginger root and steep in 2 cups of hot water, covered, for 10 minutes. Strain and add a slice of lemon and a spoonful of raw honey. Echinacea: Echinacea root is one of the most widely used botanicals for cold and flu prevention. It’s been shown to reduce both the severity and the duration of colds. 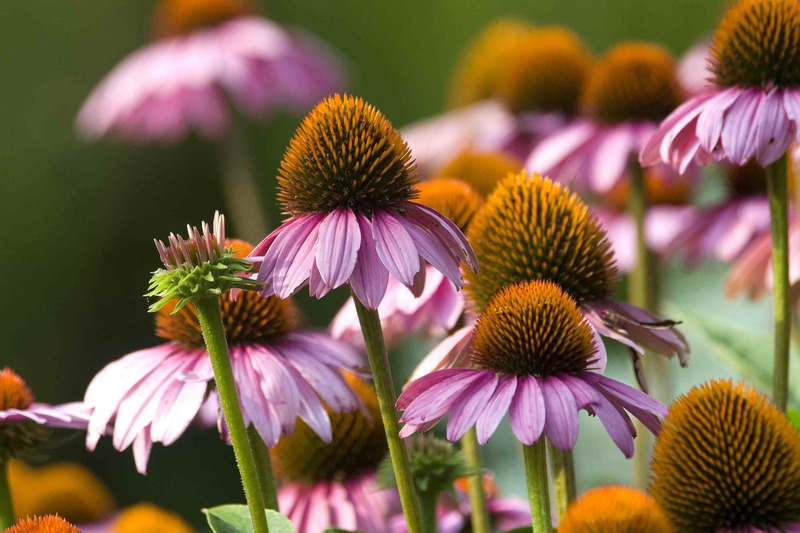 Studies suggest echinacea contains active substances that support immune function. If you’re someone that gets sick every flu season, take it in capsule form when cold and flu season comes around, and you might be surprised to find that you rarely ever get sick! Do you take the same medicinal herbs all year long? It might be time to shake up your routine and shift your daily botanicals along with the seasons. This fall, load up on nourishing roots and immune-boosting medicinal mushrooms for a change of pace, less medication use – and a healthier season. If you want to learn where to purchase top quality herbs so you can get the best price for your money and also help women around the world, you can learn about DharmaMoms right here!